Often described by coworkers as a “utility player,” Meg G. Anderson has worn many hats throughout her 15-year career. A dedication to quality, clear communications has enhanced the work of each and every hat. Early years were spent in Jackson, Mississippi, in junior administrative and marketing roles at Forestry Suppliers, Inc., an ecommerce distribution business specializing in outdoor tools and supplies founded by her grandfather in 1949. After graduating from Emory University with a degree in English & Creative Writing (and a minor in religion), she spent a summer reading unsolicited children’s book manuscripts and copyediting educational marketing materials. 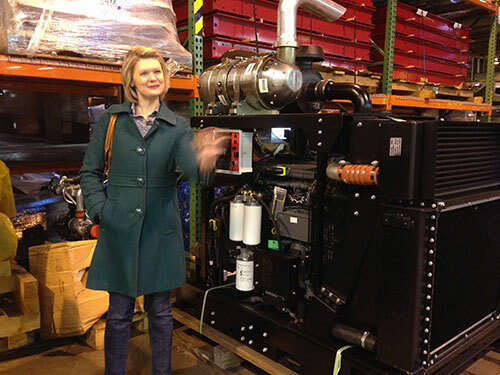 Meg enjoying a warehouse tour in Norcross, GA.
Over the next decade, several hybrid roles allowed her to diversify her writing skills and gain experience in internal communications, software and technology support, training, project management, account management, email marketing, web design, and HTML coding. Most recently, she completed her Executive MBA at Georgia State University. She also serves on the Board of Directors of Forestry Suppliers, Inc.
Meg G. Anderson founded Luminary Works in 2016. In her spare time, she enjoys Words with Friends, Scrabble, yoga, paddleboarding, cooking, reading, gardening, jazz, Braves baseball, and traveling the globe (5 continents and 23 countries so far!). She lives in Atlanta, Georgia, with her husband, Wyatt, and a spunky Norwich Terrier named Howard.